Vietnam has one of the fastest-growing, most vibrant economies in Asia, forecast to be one of the 10 fastest growing economies in the next few decades. 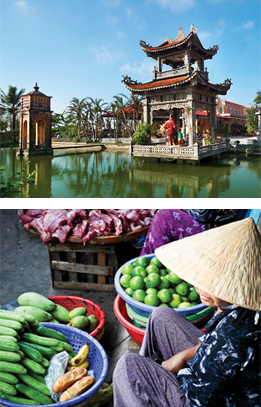 Vietnam is becoming an increasingly important trade partner for Ireland. Bilateral trade between Ireland and Vietnam reached €180 million in 2010 and Ireland’s Minister for Trade and Development visited Vietnam in October 2010 to assess the impact of Ireland’s development aid programme and further trade between Ireland and Vietnam. Ireland also continues to support demining and clearance of unexploded bombs in Vietnam. Commodities: Machinery and equipment, petroleum products, steel products, raw materials for the clothing and shoe industries, electronics, plastics, automobiles. Commercial Invoice must clearly state itemised products and value. The term of trade (the Incoterm® 2010 rule) must also be stated on the invoice. If an Incoterm® rule isn’t stated then a local Freight charge will be applied to the shipment for tax and duty calculations. Duty Free Value of 1,000,000 Dong is based on CIF value (Cost, Insurance & Freight value). Shipments up to this value are exempt from duty, but VAT and Special Sales Tax may still apply. DHL can assist you with getting everything right. You can speak to your Account Manager or contact Customer Services on 1890 725 725 for advice. Vietnamese Customs prohibit or restrict the import of the following items into Vietnam. Logistics providers will also have a list of items that are prohibited or restricted for transport to any location, for example dangerous goods. DHL’s standard list of prohibited items also applies.